’81 and Rachel Veron ’02. Throughout the year, construction continued on the Academy Student Center. This facility will give SJA much-needed space for many programs that promote health and wellness. In addition, it will provide SJA with a venue that holds 1,700 people so many more alumnae, parents, grandparents and friends can attend events and ceremonies. We celebrated the soft opening of this facility on May 18, 2018, at the Honors Convocation for the class of 2018. If you haven’t had the opportunity to see this wonderful addition to campus, I encourage you to do so at your earliest convenience. We recognized the need to refresh our strategic plan and started that process. We want to ensure that SJA is not only meeting the needs of our students today but is ready for the students of tomorrow, as well. We continued SJA’s tradition of providing a wellrounded, top-quality education to young women to prepare them to be the leaders of the future. SJA continues to look for opportunities to add more Advanced Placement and dual enrollment classes to give our students the opportunity to earn college credit before leaving SJA. At the same time, we never forget the lessons taught to us by the Sisters of St. Joseph, to care for our dear neighbor and to continue the SJA mission to provide a holistic, top-quality education to any young woman who desires it. I would like to thank all the members of the SJA Board of Directors, especially Tim Barfield and Mike Moran (past chair), for their dedication to the Board. I would like to thank the SJA faculty for their work ethic and tireless determination to give our daughters the very best education possible. I would like to thank the parents who entrust us with their daughters’ education and recognize the many ways you support SJA. under the supervision of the SJA Foundation Board. memorial gifts, bequests, endowed scholarships, special awards and various other contributions. Foundation provided 137 students with assistance totaling $627,273. Aiding these families is at the heart of the Academy’s mission. Endowed Funds in the SJA Foundation Designated to improve a specific area of school life Choose Well Fund* Sister Ursula Harelson, CSJ ’45 and Sister Jean Fryoux, CSJ ’38 Fund for Science* Sister Felix Loup, CSJ Fund for Liberal Arts* John A. Moore Family Fund for Faith Development* The Dorren Schmitt Endowed Fund for STEM The Science, Technology, Engineering and Mathematics (STEM) Endowment Fund Sevin Technology Fund* SJA Fund for Athletics Barbara Womack Endowed Fund for Maintenance* *Fully Endowed Special Awards Special awards are presented to individual students based on criteria established by the donor in collaboration with SJA. Frank M. Bologna Award Breaking Barriers Award Adalié Brent Award Good Works Award Greater Baton Rouge State Fair Award Cyrus A. Greco Award The Allison Grace Honeycutt ’13 Memorial Award Beta Club Marjorie Claire McAnelly Memorial Award Adeline L. McManus Award Medaille Outstanding Classmate Award Courtney Myshrall Memorial Award Jeff Nola Award Michelle Root Award Serra Club Award State Fair Award Mae Stokes Scholarship Award Jeannette Svendson Memorial Award For more information, please contact Sister Joan Laplace, CSJ in the Mission Advancement Office at (225) 388-2220 or laplacej@sjabr.org. SJA FOUNDATION DONORS | ANNUAL FUND PROGRAM Gifts to the Annual Fund have an enormous impact on SJA’s ability to enhance its standards of excellence in teaching, scholarships, student development and facilities. Annual gifts fuel the success of the Academy and touch every aspect of our students’ experience. In 2017-2018, Annual Fund donations provided funding for academic, athletic and co-curricular programs as well as opportunities for faith development. Gifts enabled SJA to promote professional development for faculty and staff members, supply needed resources for updating classrooms, add a new laser printer in the Andrea Clesi McMakin ’74 STEM Lab and create much-needed parking. The entire campus benefited from Annual Fund dollars. 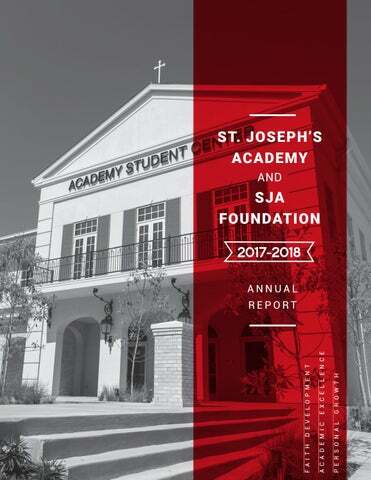 The 2017-2018 Annual Fund program at SJA totaled $514,442. SJA owes a great debt of gratitude to the volunteer leadership of the four divisions that constitute the Annual Fund program: Parents, Alumnae, Friends and Faculty/Staff. Thanks go to Patti and Mike Hiller, Parents Annual Fund; Kim Wong Kwan ’79, Alumnae Annual Fund; Peggy and Pete Prosser, Friends Annual Fund; and Nan Murtagh and Pat O’Hara, Faculty/Staff Annual Fund. Gifts are welcome in the form of cash, checks, pledges, credit card transactions, electronic debiting, stocks and matching gifts. Online donations can be made on the school website at www.sjabr.org. St. Joseph’s Academy is grateful to all parents, alumnae and friends who shared in the tradition of giving during our 2017-2018 Annual Fund Program. Donations included in this report were made between July 1, 2017, and June 30, 2018, SJA’s fiscal year. HERITAGE SOCIETY (Gifts of $9,719 and above) The Heritage Society is SJA’s premier donor level, which recognizes the total number of SJA alumnae (9,719) through the 2017 graduating class. 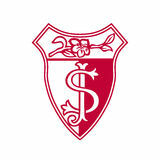 SHIELD SOCIETY (Gifts of $5,000 to $9,718) The Shield Society, symbolized by the SJA shield, recognizes our deep ties to tradition dating back to 1868. GUARDIANS OF THE ACADEMY SOCIETY (Gifts of $250 to $499) The Guardians of the Academy Society pays tribute to those who have supported the school in its mission. Dr. and Mrs. Jay Parenton (Stephanie Fife ’04) Mr. and Mrs. Christopher Parker (Amy Panepinto ’98) Mr. and Mrs. James T. Parker (Jennifer Aguillard ’94) Mr. and Mrs. Owen Parker (Nancy Donaldson ’57) Ms. Robin Duvieilh Parker ’82 Mr. and Mrs. Dolph Parro (Mar’Sue Mitchell ’81) Mrs. Barbara Parsons and Mr. Donnie Jarreau (Barbara Bhacca ’93) Ms. Nancy Patout ’90 Mr. and Mrs. Julian S. Patty Jr. (Carol Verges ’82) Mr. and Mrs. Austin Peavy Mr. Charles Pecquet Ms. Bonnie E. Pecue ’11 Mrs. Kristen Johnson Pellegrin ’04 Dr. Lisa Perez Dr. Jennifer A. Perone ’01 Mr. and Mrs. Michael R. Perrault (Julie Brabetz ’91) Ms. Andrea Perry Dr. and Mrs. W. Brian Perry (Holly Hundemer ’82) Mr. and Mrs. Rhett Petite Mr. and Mrs. Justin Phillips Mrs. Mildred Pickell Mr. and Mrs. Andy Piner (Britney Myshrall ’92) Mr. and Mrs. Scott Pittman Mr. and Mrs. Eric V. Pizzalato Mr. and Mrs. James Plaisance (Jennifer Rea ’94) Mr. and Mrs. David Planche Jr. (Patricia Nutter ’69) Mr. and Mrs. Charles Plauche Mr. and Mrs. Eugene V. Plauche II (Michelle Sutton ’90) Mr. and Mrs. Paul Plauche Mr. and Mrs. Jeffrey V. Poche Dr. William Poche Ms. Jennifer Politz ’92 Sister Chris Pologa, CSJ Ms. Elaine Polozola Mr. and Mrs. Yves A. Poret (Mary Cecelia Donaldson ’62) Ms. Meredith M. Portwood (Meredith Mallory ’04) Mr. and Mrs. Charles Pourciau Mr. and Mrs. Huey P. Prater (Zita Gillis ’59) Mr. and Mrs. Duffy Prather Mr. and Mrs. Charles Prejean Sr. ANNUAL REPORT - 2017-2018 Ms. Ms. Ms. Ms. Ms. Ms. Ms. Ms. Ms. Ms. Ms. Ms. Ms. Ms. Ms. Ms. Ms. Ms. Ms. Ms. Ms. Ms. Ms. Ms. Ms. Ms. Ms. Ms. Ms. Ms. Ms. Ms. Ms. Ms. Ms. Ms. Ms. Ms. Ms. Ms. Ms. Ms. Ms. Ms. Ms. Ms. Ms. Ms. Ms. Ms. Ms. Ms.
Ms. Ms. Ms. Ms. Ms. Ms. Ms. Ms. Ms. Ms. Ms. Ms. Ms. Ms. Ms. Ms. Ms. Ms. Ms. Ms. Ms. Ms. Ms. Ms. Ms. Ms. Ms. Ms. Ms. Ms. Ms. Ms. Ms. Ms. Ms. Ms. Ms. Ms. Ms. Ms. Ms. Ms. Ms. Ms. Ms. Ms. Ms. Ms. Ms. Ms. Ms. Ms.
OTHER GIFTS Gifts in these categories were made between July 1, 2017, and June 30, 2018, SJA’s fiscal year. Fully endowed scholarships and funds are designated with a diamond (◆). DESIGNATED GIFTS (Includes Tuition Assistance, Designated Gifts, Summer Mission Trips) Mr. Mr. Mr. Mr.
Mrs. Mary Ann Polozola Azar ’59 Mr. and Mrs. Jerome Barbera Mr. and Mrs. Sam Battaglia Mr. Douglas M. Beauchamp Jr. Mr. and Mrs. Bobbie L. Beebe (Jeanne Boudreaux ’54) Mr. and Mrs. James O. Blouin Jr. Mr. Michael Boies Mr. and Mrs. Joseph L. Boneno Mr. Laury J. Bordelon Ms. Donna Brazile Mr. and Mrs. Dale Brazzle Mr. and Mrs. David Brazzle Mr. and Mrs. F. M. Brooks Mrs. Mary Pat Broussard Mr. and Mrs. Duke Brown Mr. and Mrs. Elton Brunet Ms. Lena Bujol Mr. and Mrs. Glen Bynum (Linda Barry ’78) Ms. Tammy Cagnolatti Mr. Calliway Callicot Dr. and Mrs. Dominic Cangelosi Mr. and Mrs. Robert L. Cangelosi Sr. Ms. Charlene Cappo Mr. and Mrs. Sal Cashio Jr. Mr. and Mrs. Trent Cashio (Maria Horvath ’90) Mr. Don Chesson Jr. Mr. Shannon Christian Class of 2017 Mr. and Mrs. Rodney Cobb Mrs. Claire Brechtel Collier ’46 Mr. and Mrs. Sammy Collura Ms. Constance Cook ’22 Mr. and Mrs. Benny Crawford Mr. and Mrs. Francis Crifasi (Sally White ’52) Ms. Diana Cronan Mr. Peter Cronan Ms. Rebecca Cronan ’81 Ms. Shannon Culotta Mrs. Erika D’Amico Mrs. Jackie Daniels Mr. and Mrs. William Dart Mr. and Mrs. Ryan J. Dauzat (Shirley Marino ’55) Mr. and Mrs. Charles Davis Mrs. Marilyn Davis Mr. and Mrs. Peter Davis Mr. and Mrs. John David Dawes (Aimee Fourrier ’95) Mr. Allen DeArmond Mrs. Winnie G. Denova Mr. and Mrs. Laurie Drago Jr.
(Lifetime Gifts of $100,000 or More) This society acknowledges the significant role of Jean-Pierre Médaille, SJ in the establishment of the Congregation of St. Joseph in 1650 in LePuy, France. Following are the newest members of the Father Jean-Pierre Médaille Society. Bone & Joint Clinic of Baton Rouge Anne and Tom Meek Sarah and Shane B. Morrison Catherine Tarbett and Servando Henry Mendez (dec.) MISSION STATEMENT The mission of St. Joseph’s Academy is to educate young women as responsible and unifying members of the world community. In the spirit and charism of the Sisters of St. Joseph, St. Joseph’s Academy offers opportunities for faith development in the Catholic tradition, academic excellence and personal growth.